Spring flowers, originally uploaded by The Bacher Family. There are few things more beautiful after a long winter than spring flowers. These are just outside my breakfast window, and they looked so fine as the morning sun came over the fense into our back yard, highlighting each bud. They looked good to a hummingbird, too, but he was too quick for me -- I was never able to anticipate where he'd be well enough to catch him in the fraction of a second it took to press the shutter. 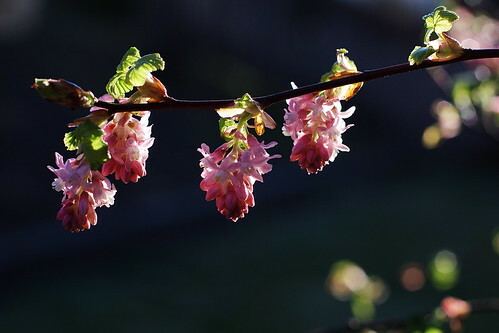 Still, I can't complain, with red flowering currant blossoms like these shining translucently in the morning light.